Lori has been with Excel Education Systems for over a decade and has worked through the ranks to become our Vice President of Operations. Lori lives in North Carolina with her husband and three children. She received a Bachelor of Education degree from William Carey College and earned her Master's in Education from Southeastern Louisiana University. Lori taught school in Mandeville Louisiana for seven years. She worked and served on various curriculum committees within the school district to improve Language Arts and Social Studies teaching methods. Lori assisted with coordinating several Social Studies World Travel Days and served as a committee member for an event that helped local teachers enhance their teaching practices. Lori also mentored and trained high school students toward future teaching careers. She has fond memories of playing college soccer with her twin sister. She continued with her interest in soccer by coaching at the local high school and select soccer travel leagues. In her spare time, Lori enjoys jogging, reading, family time, and church activities. Lori is excited about mentoring and encouraging people for Excel High School. 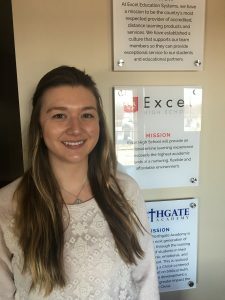 She truly enjoys each family with whom she comes in contact and provides “online” support and motivation for a successful Excel High School experience. 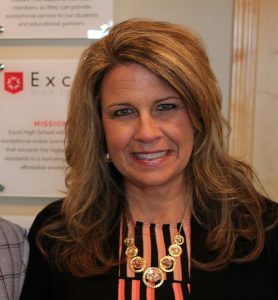 Lori serves our students and team members with excellence and loves being part of the Excel Executive Team. 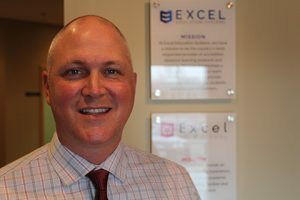 Mark serves the critical role of President and Chief Academic Officer for Excel Schools. Mark is a State licensed educator and has taught both math and science for many years in the public school arena. Mark is passionate about education and online learning. Mark received his B.A. degree in Education from Bemidji State University, and received his M.Ed from St. Mary's University and holds a doctorate in Educational Leadership from Capella University. Mark joined the team at EHS to assist with the school's mission and goals related to continuous quality improvement and a student-centered approach to learning. 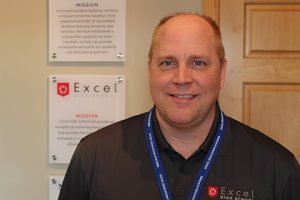 Before coming to Excel, Mark worked for Capella University, where he played a vital role ensuring student success. 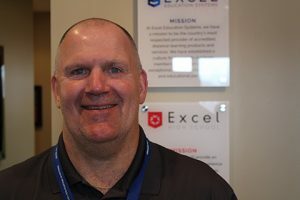 Rod is the founder, Chairman, and CEO of Excel Education Systems. With a strong background in business, marketing, and technology, Mr. Clarkson realized the value of providing alternative, accredited educational opportunities for students in need of high-quality online education services. Rod is a true visionary in the field of innovative online education technologies. 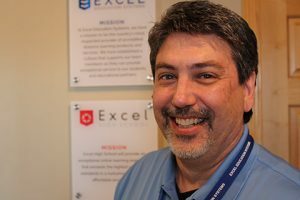 Rod leads the marketing team and business operations for Excel Schools. Mr. Clarkson has an extensive background in executive leadership and genuinely cares about each student that we have the opportunity to serve. Rod is passionate about serving others and volunteers with various community outreach efforts. Rod enjoys spending his free time with his family and close friends. Rod holds an Associate of Science degree in Business Administration, a Bachelor of Science degree in Business with a concentration in Marketing, and Master of Business, with a concentration in Management. Mr. Clarkson believes in life-learning and is pursuing his Doctoral-level Ed.S. degree in Educational Leadership at Northcentral University. Koorosh has been with Excel since our inception. He is the talent behind our student information management system; and manages all aspects of the school’s technology infrastructure. Mr. Vaziri has a B.S. and M.S. Degree in Computer Science from the University of Minnesota. 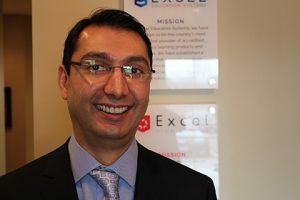 Mr. Vaziri is currently in the dissertation phase of his Ph.D. in Computer Science at the University of Minnesota. He also holds several MS certifications. Koorosh is a vital part of the Excel team and works closely with the senior management team to make Excel a great school. Koorosh spends his free time with his close friends and family. 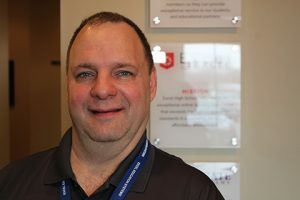 Rob is responsible for the accessibility, organization and archiving of the various types of educational media used within the coursework at the school. Rob plays a vital role in the development of EES courses and ensuring the efficient operation of our LMS. Robert holds a Bachelor of Music degree in Music Industry, with a concentration in audio recording technology and music copyrighting, licensing and management. Throughout Robert's professional career, his areas of media expertise expanded into video, with nearly 20 years of combined experience in television broadcast production and management. With another 15 years of print, digital and web media experience, Robert brings a versatile set of skills to the school to enhance the student learning experience. Robert is married with two children. Dean came to Excel with many years of Director level experience having oversight for two Job Corps locations, Mississippi and Minnesota, respectively. Dean has executive-level oversight experience with helping young adults complete high school and acquire life skills for success. Mr. Kindle serves in an essential role as part of the school operations team. Dean handles whatever comes his way with a positive attitude and a willingness to serve our students. Dean has an Associate degree in Bible from North Central University, Minneapolis, and a Bachelor’s degree in Education from Concordia University in St. Paul, MN. Dean is currently working toward the completion of his Master’s degree in Education from the American College of Education. Dean has two children and resides in St. Paul, Minnesota. Paul comes to Excel High School with over 30-years of management and customer service experience. Paul is dedicated to helping our students and parents with questions concerning the enrollment process at Excel. Paul is here to support students and parents with the enrollment process and helps to make the process worry-free. Paul's goal is to help new students and parents with the transition to online school. Paul is a fine ambassador for EHS and is willing to do whatever it takes to help students succeed as they transition to online school. Prior to coming to Excel, Paul was charged with supervising client relations and customer service for a large hotel system. Paul is currently completing his BA degree in General Studies at Ashworth College. In his personal time, Paul enjoys being a husband and father. Paul also loves the Vikings and the Minnesota Twins. Tim grew up in Plymouth, MN and now resides in Ramsey, MN. Tim is married and has two daughters. One attends Winona State University majoring in education and the other will be attending Augustana College in Sioux Falls next fall to continue her softball career and study Exercise Science. Tim received his Bachelor's degree in Business from Augsburg College, where he also played Hockey.Time earned his MBA Degree from Capella University in Minneapolis. Tim has 20 years of higher education experience working with career colleges in Minnesota as a Director. Tim has a passion for helping students and guiding them towards making a better life for themselves. In his spare time, Tim spends time at his cabin in Wisconsin with his family, hunting, and fishing. He also spends a lot of time at the softball fields watching his daughter play softball all over the country. As a former coach, teacher, and Dean of Students, Nick comes to Excel with experience in coaching, training, and counseling students. Nick has worked with students from a variety of different ages and backgrounds and enjoys helping students get the most from their educational experience. Nick’s favorite part of education is empowering students to overcome obstacles of the past by embracing present opportunities. Nick received his Bachelor of Arts in Psychology from Bethel University and his Master of Science in School Counseling from St. Cloud State University. Nick holds a school counseling license credential through the Minnesota Department of Education. In his spare time, Nick enjoys travel, exercise, and spending time on the lakes of Minnesota. Ms. Clarkson came to Excel Education Systems in 2016. Kate serves an important role of auditing incoming transcripts. Kate's attention to detail and passion for keeping students on track ensures that incoming credits are processed in a timely manner. Kate is currently finishing her BS degree in Marketing at Ashworth College and plans on attending Capella University for graduate school in the Spring of 2019. Kelly Odell first served as an instructor for Excel High School before transitioning to a role in curriculum development. Kelly has over twenty years teaching experience in both the public and private school settings. Her diverse instructional experience includes social science, English, math and exceptional education in grades 6-12. Kelly received her B.A. degree in History, from Rutgers University and earned her M. Ed. in Curriculum and Instruction, from Virginia Commonwealth University. Kelly believes in lifelong learning and continues to participate in professional development coursework. She is passionate about education and the opportunities online learning provides for students. Kelly grew up in New Jersey and made Richmond, Virginia her home after college. She enjoys practicing yoga, all things water-related, camping, and applying self- care strategies. Kelly is excited to begin supporting her son in Cub Scouts, as well as, volunteering in the organization. Rebecca relocated from California to Minnesota in December 2018 and is excited to experience cold weather winters. 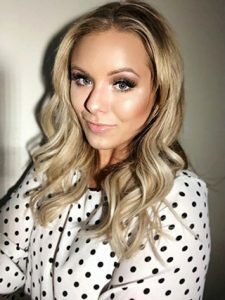 Rebecca grew up in Orange County, California, and currently resides in Roseville, Minnesota with her parents, cat, and two dogs. Rebecca graduated from Southern New Hampshire University with a Bachelor of Science degree in Applied Mathematics. Before coming to Excel High School, Rebecca taught school in California. Rebecca has a passion for teaching and loves helping students succeed. In her spare time, Rebecca loves to hike, off-road, and spend time with her friends and family. Kelsey received B.A. degrees in both Neuroscience and Psychology from the University of Colorado, Boulder. Since graduation, Kelsey has worked in a variety of schools and loves working in the field of education. She particularly enjoys working individually with students to help them succeed academically. In her free time, Kelsey enjoys running, doing crosswords, and being in nature. She also loves spending time with family, friends, and dogs whenever possible. Derek has worked with Excel for many years in the Spanish Department. 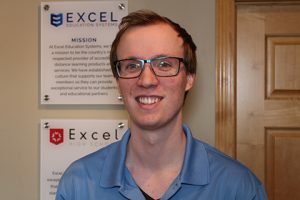 Derek has been essential in developing Excel’s Spanish program to ensure that students’ master their Spanish courses and are well prepared to meet foreign language requirements for university admission. Derek earned his BA in Spanish from San Diego State University and his Master’s degree in ESL, Curriculum and Instruction from the University of Phoenix. Ms. Christoffer brings over 20-years of customer service and bookkeeping experience to Excel High School. Sheila has been with the school since 2009 and loves her job! Sheila works diligently to ensure that all student financial records are current and up to date. In her free time, Sheila enjoys spending her free time with her family and friends. Mrs. McNeilly is a valuable member of our school system. In her role as a Student Services Coordinator, Stacy is responsible for assigning courses for all new students. 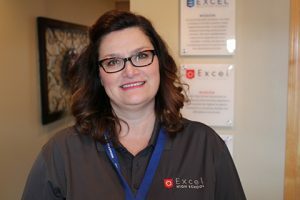 When a new student enrolls at Excel, Stacy works diligently to quickly assess student files and assign online courses in a timely manner. 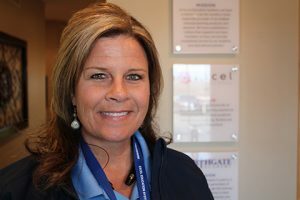 Each student's program is individualized and is unique, so Stacy takes the time required to review transcripts to ensure accurate course placement. Stacy works closely with the Excel team to provide excellent service to our students. Stacy is relentless when it comes to student success! Stacy works tirelessly to ensure that all students get access to their online courses in a timely fashion. 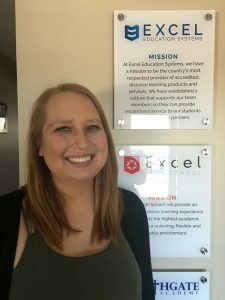 Stacy says that she is proud and honored to work for Excel Education Systems. Stacy received a Bachelor of Arts degree in Psychology from William Carey College. Before coming to Excel Stacy spent many years in Business Management; directing and leading a club with over 40 families. She later worked for an insurance company as a Licensed Agent; coordinating and organizing training material for over 50 agents. Stacy was responsible for overseeing the handling of court documents and research for a successful lead program. Stacy consistently receives exceptional work reviews. Stacy lives in North Carolina with her husband and two children. Stacy was a collegiate athlete, playing soccer with her twin sister. She still enjoys playing today and is also a committed referee of all ages at various talent levels. In her spare time, she enjoys walking her dog, church activities, jogging, fellowship with friends, and lots of family time. Frank is originally from Illinois and has lived in five other states. 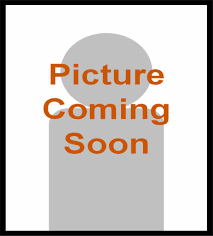 Frank's professional background includes working as a Chimpanzee Caregiver in Mesa, Arizona. Frank cared for big cats at a wildlife park in Arizona. Mr. Laccone was a dolphin and sea lion trainer in San Diego, California and in Kingsland, Georgia. Frank began teaching science eleven years ago in Kingsland, Georgia and now lives in Chapel Hill, North Carolina. Frank has taught a variety of courses at various levels from elementary through college. Before starting his teaching career, Frank earned his undergraduate degree from Purdue University in West Lafayette, Indiana. Frank was a two-time Division I all-American whDivisiontling for Purdue. Frank attended The University of Nebraska and earned his Masters Degree in Entomology. Frank keeps busy with his awesome family. Frank has two sons, Isaac and Talon and is married to his wonderful wife, Shara. Frank enjoys hiking and camping. Frank has a true for love nature! Frank's favorite hobby is beekeeping. Frank has been a hobby beekeeper for the last four years; and also does some research with butterflies and moths. Frank looks forward to getting to know each and everyone one of his students. Josh has over 15 years of business experience and 10 years in higher education. Josh holds a Bachelor of Science degree in Sports Management & Marketing from Minnesota State University, Mankato and received his MBA degree from Capella University. 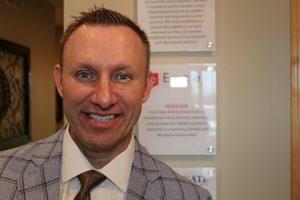 Prior to coming to Excel, he served as a Senior Academic Advisor at Capella University where he played an important role in ensuring student engagement and success. Josh has also worked in the Finance area at Ceridian and in the Quality Assurance area for a leader in the Health IT industry. In his personal time, Josh enjoys spending time with his wife and two children. He is also a big Minnesota sports fan. Kara lives in North Carolina with her husband and three children. She has a Bachelor of Music Education degree and a Master of Music degree from the University of NC at Greensboro. Kara was the Director of Bands at Western Middle School in Elon, NC, for three years, leading the program to contain over 300 students, while winning numerous awards and superior ratings. Upon having her first child, Kara chose to stay home to be a full-time wife and mother. While home, she also worked for an insurance company, handling the collection of court documents for the lead program. Kara has also always homeschooled her three children and is completing her 10th year as a homeschool mom. She finds tremendous satisfaction in seeing her children grow in their studies while being able to lead and guide them during this critical time in their lives. Currently, she is also a lead instructor at Alamance Community College in the GED program at night. Kara is devoted to serving all her students, seeing that they all have the opportunity to find success. She is very thankful to be a part of the Excel team! In her spare time, Kara enjoys spending time with her family, attending her children's activities, leading the children's choir at her church, and fellowshipping with friends. Stephanie has called North Carolina home all her life. She is married to her high school sweetheart and is raising four sons. She graduated from UNC-Greensboro with a Bachelor of Science degree in Elementary Education and a Concentration in English. Stephanie taught in the Alamance County school system before becoming a stay-at-home mom. She homeschooled her children for twelve years and was very active in the homeschooling community. Stephanie led her local homeschool co-op and taught various enrichment classes. She is a teacher at heart and counts it a privilege to be able to help students excel and continue to be a stay-at-home mom. Stephanie enjoys teaching second grade Sunday school, spending time with family and friends, and dating her husband. 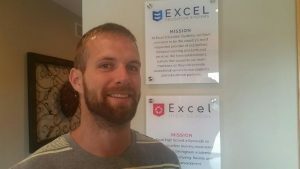 Joe joined the Excel team to help support our students with their challenging math courses. Mr. Williams has years of tutoring support experience at the college level and received his training and certification as a level 1 & 2 tutor through CRLA. Joe earned his Bachelor Degree in Applied Mathematics and a BA in Music Composition from St. Cloud State University. In his spare time, Joe enjoys spending time with family and friends. Joe can often be found composing and pursuing his love of music. Nicole is Excel's Registrar and she has one of the busiest offices in the school. Nicole is in charge of student records and processes graduations, transcript requests, proof of enrollment requests, proof of graduation requests, and helps to manage the school office. Nicole has a bright smile and loves to serve our students. Before coming to Excel, Nicole worked for a career college where she served as the Campus President, Dean, and Registrar. Nicole has over a decade of experience as a Registrar. Ms. Drilling earned her bachelor's of science degree in Child and Family Development from San Diego State University. In his spare time, Nicole enjoys spending time with family and friends. Myra resides in McMinnville, TN with her husband of twenty years and their six children. Before becoming a stay- at- home mom and homeschooling her children, Myra was an Applied Behavioral Analysis Consultant for children with developmental disabilities. Myra earned her Bachelor of Science degree in Psychology at William Carey University before moving on to complete some course work in Psychology and Counseling at New Orleans Baptist Theological Seminary. As a Senior Behavioral Consultant and treatment specialist, Myra would fly around the south east setting up home programs for children with varying disabilities. She was brought into the home or school to train student therapist in behavioral intervention and speech therapy. Myra established home based early intervention programs and trained 4-7 student therapists at each home to execute the individualized behavior plan/curriculum she created for each child. Some of her responsibilities included recording, collecting and graphing data, telecommunication on a weekly basis with the home programs and follow-up visits twice a year to each home. One of the most rewarding experiences of her career as a therapist was teaching non-verbal children to speak. Myra has a love for teaching and helping students reach their highest potential. Currently, around her busy life as a mom she is substitute teaching and holds a National D Soccer Coaching license. She coaches soccer with the Travel Soccer Club in her town. In her spare time, Myra loves spending time with her family, watching her children play soccer and is an avid runner, completing several full and half marathons. Myra is thrilled to be a part of the Excel High School team to support students in fulfilling their educational goals.